Another fun craft for Halloween. These spiders are quick and easy to make and are great for decoration and for giving to children at the end of a Halloween party. They are a bit bottom heavy so don’t hang well but look great on a web! I made the web below from a hoop . You could spray the hoop silver or wrap it in fabric or crepe paper before making the web but I didn’t bother because it won’t be noticeable by the time I’ve filled it with spiders! It’s better to make the web from string or a strong wool. A flimsy web will not secure the spiders. The hoop can then be placed on a wall but I think it’s more effective hung from the ceiling or a doorway. That way you can fill both sides with spiders and it will look really cool spinning round. Do secure with a dab of glue, the points where the wool wraps round the diagonals otherwise your web will very quickly deteriorate! I need to do this with mine before I put any more spiders on! Very little! 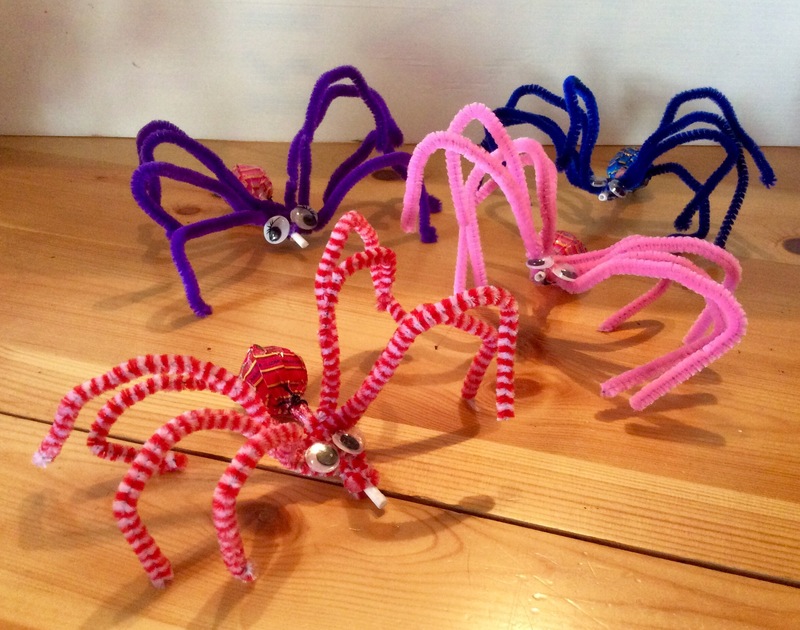 Each spider uses four pipe cleaners, two eyes and a Chupa Chups lolly. That’s all. It’s so easy that’s there’s really no need for instructions. The only thing you need to remember is to lie all four pipe cleaners together side by side and wrap then round the lolly stick together tightly. If you try to do it one at a time it’s fiddly and you will probably get in a mess! You can use a blob of glue to secure. The eyes are stuck on with glue too. It is possible to cut the sticks a little shorter if you feel they protrude too much.